When I began speaking to Stacie about her upcoming bridal portrait session, I knew one thing was of utmost importance to her wanted a fairytale. Even though she was getting married at an entire different venue, The Millennium Center in downtown Winston-Salem, I was able to finagle the absolutely stunning Graylyn International Conference Center which was the home of the Wachovia bank founder Bowman Gray, Sr and his wife Nathalie Lyons Gray. The property has been in use as a medical facility, a academic facility and now a boutique hotel and conference center. It is one of my favorite places to shoot in the Carolinas. This glorious home is a flagstone with beautiful windows, and the circular Grand staircase witch is just to dir for! 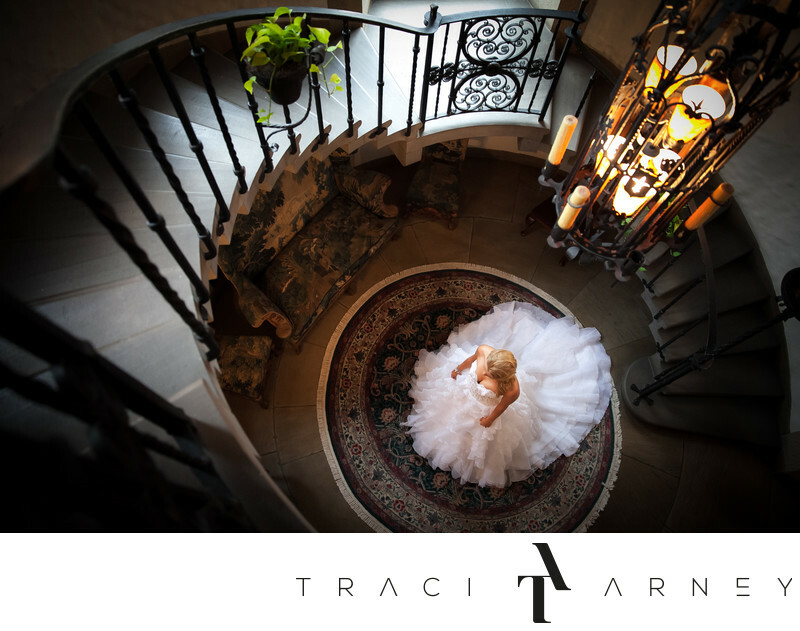 For this image, I had Stacie step to the center of the staircase and I shot from the third floor being sure to keep the beautiful chandelier for added color and interest in the image. I love how she stands out of the darkness, how every line and pointing device leads directly to her, how the image is balanced even though there is nothing symmetrical about the image. Location: Graylyn International Conference Center - 1900 Reynolda Rd, Winston-Salem, NC 27106. Keywords: Ariel (6), Bridal Session (210), Graylyn International Conference Center (27), NC (636), Staircase (6), Winston-Salem (111). 1/30; f/2.8; ISO 1600; 24.0 mm.